A new report out reveals that two new cancer drugs could extend the survival rate among patients suffering from the deadliest form of skin cancer, melanoma. Cynthia Bowers reports. (CBS/AP) The FDA has approved a new drug called Erivedge to treat basal cell carcinoma, the most common form of skin cancer. Federal regulators announced Monday the approval of the Erivedge pill, the first drug ever approved for treating basal cell carcinoma. Typical BCC treatments include outpatient procedures such as freezing or surgically removing the cancerous area. The pill is made by Genentech, a unit of Swiss drugmaker Roche. Erivedge is a once-per-day capsule that's intended to treat locally advanced cancer for patients who are not candidates for surgery or radiation, and for patients whose cancer has spread to other parts of the body. Genentech said the drug will be available within one to two weeks. The drug's label will warn that it is linked to fetal death and severe birth defects when it is used by pregnant women. The most common side effects of Erivedge include muscle spasms, hair loss, weight loss, diarrhea, fatigue, changes or loss in sense of taste, decreased appetite, constipation, and vomiting. Curis Inc. of Lexington, Mass., which collaborated with Genentech on the drug, is getting a $10 million payment from Genentech now that the drug has been approved. The approval comes ahead of schedule, as the FDA previously said it would make a decision on Erivedge by March 8. The drug was given a fast six-month review because there are no approved treatments for basal cell carcinoma. 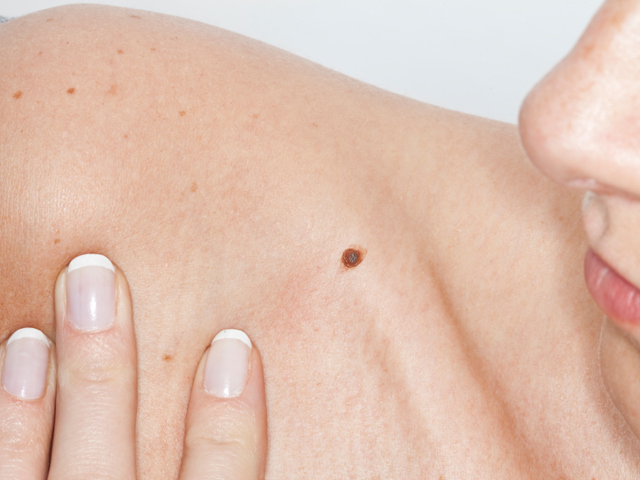 Basal cell carcinomas strike an estimated 2.8 million Americans each year. BCCs are not usually fatal, but can be very disfiguring if they continue to grow, according to the Skin Cancer Foundation. In rare cases, a BCC can spread to other parts of the body, becoming deadly.